Nicole's Needlework: A Little Stitching and an Early Present! I decided to start Margaret Cottam after I finished Mary Roe. I only stitched a little bit because I wasn't sure if I was liking the linen I chose for it. It's much lighter than the called for linen. My early birthday/Christmas present is the new iPad. My kids had pretty much taken over my old iPad and I really missed having one all to myself. So my very sweet dh took me shopping today. My birthday is still weeks away, but I wanted something for when I go to Myrtle Beach. I'm so happy with it! Speaking of Myrtle Beach - I leave in only six days now! I can't wait!! Looks beautiful so far. I like the linen color. Can't wait to see it done! Love those colors with that linen color! I think that the linen is great for Margaret! I'm suppose to be doing that for a Guild SAL and I was on the fence about what fabric to use, but I like yours and think I will go with that. Congrats on the new Ipad! I love mine and wonder how I got along without it!! I love your Margaret on that linen! Making me want to start stitching it too. I had given up on Mary Roe - but after seeing your finished piece, I got it right back out! I want an I-Pad soooo badly! But the chances of me getting one are slim and really none! ha! I think that's a fabulous choice of linen! I spent a weekend at Myrtle Beach years ago - very lovely ... have fun! I do like the color of the linen. Nice new starts!Have a fun trip. Very pretty stitches! 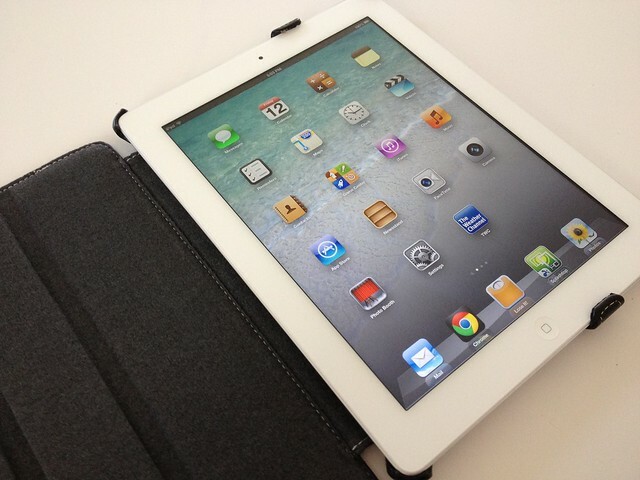 Enjoy your new iPad and have fun on your trip! Nice present!! :D I'm hoping the iPad mini is actually going to happen. I want one. lol! Love how Ann Priest is looking! Love Margaret Cottam too! Love your choice - really makes those fibers pop! Nice present and DH. Only a few days away - yeah! 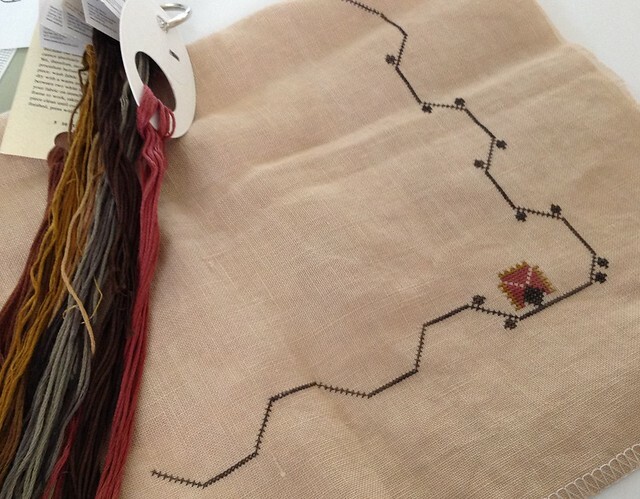 Beautiful stitching starts! I'm still trying to justify an iPad since my laptop is in my lap all the time. Non-techy husband can't see the point. UGH! I love the colours and I think both your samplers will look beautiful. I'm loving Margaret on that linen; ooh, and ipad; sweet! Great progress! congrats on a new ipad!! The linen and threads look great! Enjoy your new iPad and have a fun trip! 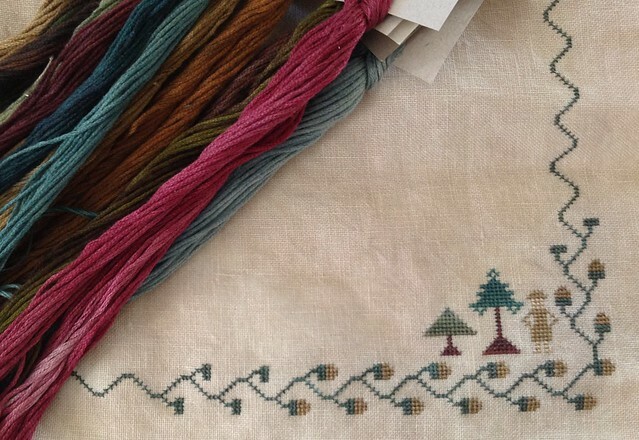 Nicole, your sampler is looking great. I always enjoy seeing what you are working on. You asked a question on my blog, and I can't find a way to respond since your profile nor your blog have an email address. Please email me, and I'll let you know what threads I used on Mary. Great WIPs! Happy early birthday too. Can't wait to hear all about your trip when you return. Have fun! Lovely stitching & congrats on such a wonderful gift !!! I love the colour of linen, too! and congrats on a great gift! I'm so happy to have met you and all the pals!